The NuVue RowGro Tunnel creates a perfect environment for an extended growing season. Use it in the spring to get a jump start or during the growing season and all summer long. It filters the sun's harmful rays to prevent burning or drying, keeps insects out and protection from overnight frost. Easy access panels at each end enabling you to vent the tunnel on extremely hot days and to allow for easy routine watering. This potting table features a roomy counter that provides plenty of work space for your gardening projects. The ample cabinet storage with shelf lets you organize garden supplies so they're within quick reach and the sturdy lattice supports multiple hanging plants and work items. Doubling as a buffet table, hobby station or fashionable home accent, the potting table creates a charming focal point indoors or out. Crafted of solid wood harvested from the Cypress tree family, it offers decay resistance similar to Western Red Cedar. Ships anywhere in North America. The NuVue Winter Heavy-Duty Shrub Cover is better than burlap for protecting plants, trees and shrubs from heavy snow damage, winter burn and pest control. It is easier to use and can be used for multiple seasons. Pops open easily and stows away when not in use. Size is 28" Wide X 30" High and comes complete with 4 ground spikes to secure to the ground. 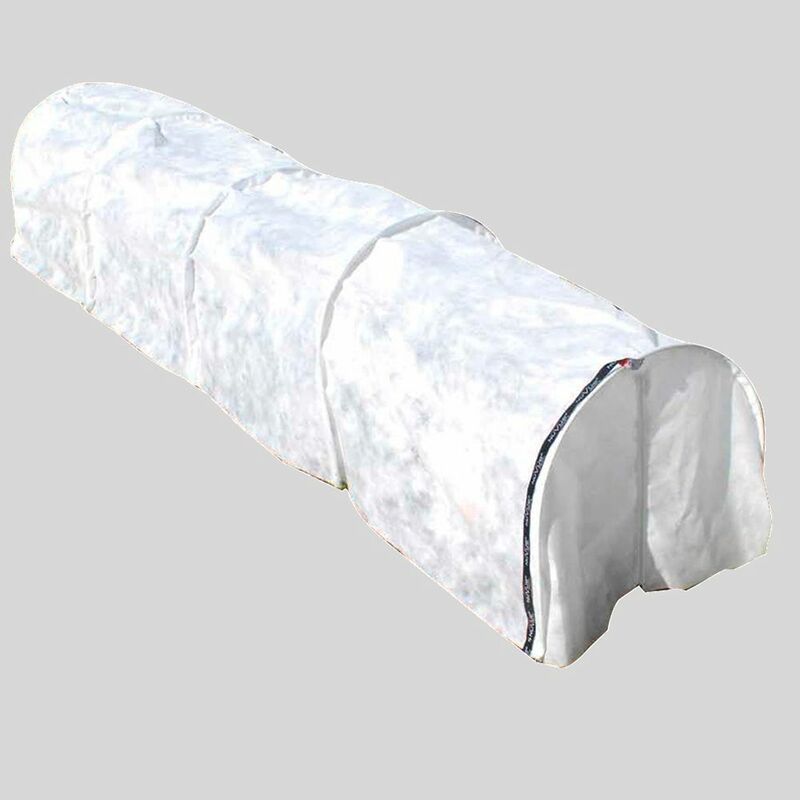 Provides a protective shield that blocks out snow, salt, ice and freezing rain while allowing air, sun and rain to penetrate which is critical for plant life. The NuVue Hanging Plant Basket Frost Cover is the perfect frost protection solution for hanging flower baskets or potted plants. High Tech Insulating Fabric won't breakdown and is re-usable! Quick and Easy installation. Fits any hanging flower basket up to 18" in diameter. The NuVue Synthetic Burlap is better than traditional burlap and is made of High-Tech Synthetic Weave Material. It is re-usable and long lasting. Use it as a wrap or fencing and is environmental green in colour, will not rot or mould and will not wick away moisture from plant which causes winter burn. Twine is built into the fabric and can be cut to any length. Size is 42" Wide X 25 Foot roll. RowGro Tunnel The NuVue RowGro Tunnel creates a perfect environment for an extended growing season. Use it in the spring to get a jump start or during the growing season and all summer long. It filters the sun's harmful rays to prevent burning or drying, keeps insects out and protection from overnight frost. Easy access panels at each end enabling you to vent the tunnel on extremely hot days and to allow for easy routine watering. RowGro Tunnel is rated 5.0 out of 5 by 5. Rated 5 out of 5 by JL from Third season using this product in the garden, love them.... Third season using this product in the garden, love them. Can be a little fussy trying to place each hoop in the exact right width and height but once they are set they are good to go. The white cover has lasted us through two seasons before - would be good to know if they are sold separately so we can replace the covers. Rated 5 out of 5 by Albertodude from Great buy for the money. Great buy for the money. Rated 5 out of 5 by Rozmataz from I'm an elderly woman who likes to garden. This year,... I'm an elderly woman who likes to garden. This year, I am using raised beds. I tried out 2 of these row covers and was so happy with them, I ordered 2 more. I can cover both raised beds. I can store them in the well-made plastic bags they came in at growing seasons end. Rated 5 out of 5 by Larry from Love it. My Broccoli is growing much faster now.... Love it. My Broccoli is growing much faster now.